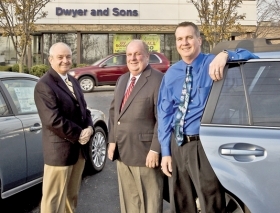 From left, Pat, Jim and Frank Dwyer, the dealer principals of Dwyer and Sons Volvo-Subaru in Commerce Township, Mich., near Detroit. Says Pat Dwyer: "We're trying to offset the decrease in Volvo business with the increase in Subaru business." Dwyer and Sons Volvo-Subaru got some much-needed help from Subaru sales last year. About a decade ago, when Volvo sold its car division to Ford Motor Co., the Dwyer family felt like it had won the lottery. After the sale in 1999, "We figured we would be selling 500 or 600 Volvos a year," said Pat Dwyer, one of three dealer principals of Dwyer and Sons Volvo-Subaru in Commerce Township, Mich., a Detroit suburb. That didn't happen. But today the Dwyers feel fortunate in a different way -- for the other brand that was once not nearly as enticing but is now saving their business. "We're doing a balancing act," he said. "We are trying to offset the decrease in Volvo business with the increase in Subaru business." Where misfortune enters, sometimes fortune finds its way. In many ways, Dwyer caught a brand on the way up, while another was on the way down. Dwyer's Volvo sales hit nearly 1,100 new vehicles in 2002 thanks to a healthy fleet business. The dealership was so optimistic about Volvo's potential that the dealership doubled the size of its service department in 2003. A few years later, the bubble burst. Fewer Ford employees led to a slowly eroding annual sales rate and a recession put Volvo sales into a tailspin. Add the uncertainty surrounding Ford's $1.5 billion sale of Volvo to Chinese company Geely Holding Group in August, and things got worse before they got better. After averaging about 500 new units annually for several years, Volvo sales slipped to 305 in 2008 and just 133 last year. After breaking even in 2008 and 2009, the dealership lost money last year and laid off 10 percent of its staff. Volvo's products are terrific, but "based on the volumes that you see, in a sense we are starting over," Dwyer said. "Subaru has a terrific vision in terms of being consistent with their marketing, very creative," he said. "We are retaining Subaru customers in our lease portfolio" and "attracting new customers to the brand." Subaru sales have been trending up over the years and hit 392 new vehicles in 2010. This year Dwyer is hoping for a 10 percent increase in Subaru sales. "Subaru is a bright spot for us," he said. Dwyer's dealership is located about 30 miles northwest of Ford's global headquarters in Dearborn. Volvo and Subaru have separate showrooms, sharing service, parts and the body shop. The Ford link generated employee and family sales, along with supplier and fleet sales. But the slide in Dwyer's Volvo sales coincided with rumors Ford was preparing to sell the Swedish automaker. "The more talk there was about the sale, the fewer employee sales we received," he said. "Our Ford clients weren't comfortable leasing cars knowing that Volvo would not be a Ford brand when the lease matured. That took a big part of our business away." Additionally, Volvo cut advertising expenditures as Ford sought a buyer for the company. And the Volvo sale created a range of issues that Dwyer said hurt sales. For example, Volvo doesn't have a captive finance company. "We've had low-rate financing offers in the past. When we were partners with Ford Credit we had offers that we could advertise. But since Ford Credit is no longer our captive finance company, we haven't seen any certified support," he said. To make its business model work, the Dwyer family trimmed about 10 percent of its employees in 2010, reducing the work force to about 55. The cuts included service and body shop technicians, salespeople and other employees. "We can only cut so far," he said. "We're trying to get the best productivity we can out of everybody here, maximize our opportunities." Dwyer remains optimistic about 2011, saying the biggest challenge for Volvo and the dealership is to create more interest in the Volvo brand. He expects Volvo sales to increase 30 percent this year, thanks to an advertising boost by Volvo. "In the first quarter Volvo will spend more than it did in all of 2010," Dwyer said. "Our lease offers on the new 2012 S60 T-5 front-wheel-drive sedan are competitive.